Contrary to most people in the tech blogosphere (read tech pundits with nothing better to do) I believe that there is an already existing digital divide, and one that is going to get worse the more that the Web becomes an integral part of our society and business. One of the areas where this divide is created and sustained is in the very accessing of the Web because that access is controlled by very few companies and they have proven that their interests are nowhere near in step with our social needs. For these access gatekeepers it is all about maintaining the status quo with them maximizing the service they provide with the least amount of investment to improve their infrastructure; and charge increasing amounts of money for what amounts to mediocre services. As much as we may want to rail against this type of corporate hijacking of what is become a necessary service the fact is that there is very little we can do to fight against them. It’s not like you or I could go out tomorrow and set up a more equitable system to access the Web and neither do we have any alternatives to these carrier conglomerates. Or at least we didn’t. 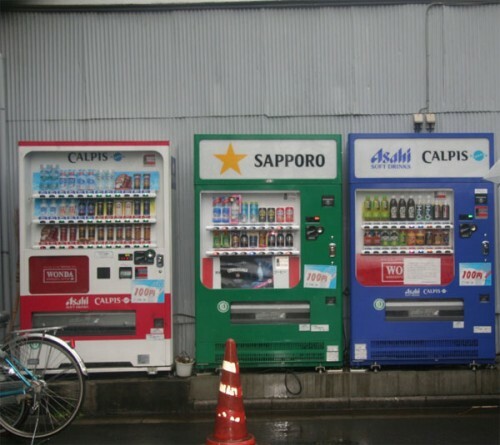 There was an interesting story floating around yesterday and today about Asahi Vending Machines in Japan that is proposing to use their vending machines as WiFi hotspots, which will allow people within 150 feet of the machines to use the Web without having to register or log in. Now let that sink in for a second. Every one of their vending machines will operate both as the ubiquitous vending machine and as an open and free WiFi hotspot. Now look around and take notice of how many vending machines are within your vicinity not matter where you are in the city. Machines that already plugged into some power source and in a growing number of cases connected to the Internet for communication between machine and home office. Going that extra little bit an including WiFi hotspots within those machines isn’t that much of a stretch. In very short order you have more than enough WiFi hotspots within any given area to be able to provide ubiquitous Internet access without mobile carriers being able to get their claws into the access points. This doesn’t have to be just limited to vending machines either. Just consider the number of “things” out in the public space that are becoming connected to the Internet of Things, and just consider that those things also start providing free WiFi hotspot access. At this point it won’t matter if you have enough money to be able to connect to the web, to be able to make phone calls – VOIP or WiFi calling would be the ticket here. In effect we would be able to sidestep the access gatekeepers and make access to absolutely everyone. Of course the chances of this happening are pretty slim but considering that we are heading into a brand new year it is always nice to be able to dream .. even if only a little.